​Hi everyone and welcome back to the Art of Business English. 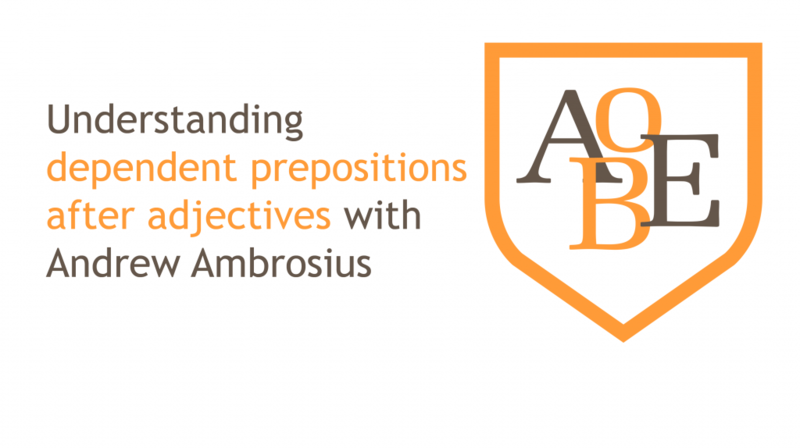 Well if you are new to the AOBE, today is the second episode of a three-part series on using dependent prepositions. If you haven’t checked out last weeks episode on dependent prepositions after verbs, then I encourage you to do so. In this week’s episode we will be looking at adjectives with dependent prepositions. As I mentioned last week, even though we are looking at prepositions we are not covering the basics like prepositions of movement, time, place etc. We are looking at more advanced structure with fixed expressions. I personally love these as once you have learnt them, they don’t change, you know them for life. As you will see, I’ve divided this episode into three parts, first we will look at what adjective + dependent preposition means, then I will give you a list of adjectives with dependent prepositions and their translation. Finally, I’ll give you some sample sentences in context. The sample sentence will be given in the context of business English, and the business area. What are adjectives with dependent prepositions? Basically, many adjectives when used in a sentence are formed with a preposition. These prepositions occur as a natural part of the English language and generally there is no rule to define which preposition goes with which adjective. This means you have to learn them by heart. The upside to this is that once you have learnt the structure it doesn’t change and there are no exceptions. When the adjective is formed with a preposition it creates a specific meaning and if you don’t use the correct preposition or no preposition at all, then it will sound wrong. So, where do problems arise? In expressions that are similar to English. For example, in Spanish, interesado en, is often confused because the expression is almost the same, interested in. Sometimes, the preposition used by non-native speakers will be on or to. This occurs when a speaker applies an incorrect translation. Generally meaning is not affected, however fluency and accuracy are. Now that we have that clear, let’s look at a list of adjectives with a dependent preposition. OK, that is the list for today, there are obviously more, however these are a good start and quite commonly used. Let’s look now at some example sentences in context. In the last part of this episode I will be giving you some example sentences with a business focus in mind. Our staff are anxious about the recent number of lay-offs, we should send a memo to clarify everything. The board is opposed to our latest proposal. We will have to go back to the drawing board. We are sorry for any inconvenience caused and hope this voucher will make up for the time wasted. FarmaCo is proud of its wide range of high quality products. As you can see, this product line is similar to the one I showed you earlier. Hello Brian, yes, it’s nice hearing from you. I’m happy to report that the new investors are enthusiastic about the latest stock price. The company is serious about undoing the damage caused by these allegations. ​Here you can see that many of these adjectives + dependent prepositions are followed by objects/nouns. If you are interested in learning more about sentence structure then I encourage you to listen to episodes 15 and 16 which you can find over at the AOBE website. Well, that is all we have time for today. I hope you have enjoyed the second part of this 3-part series. Stay tuned for next week where we wrap up the series by looking at noun preposition collocations. If you are looking for some ideas on how to study and internalise these adjectives with dependent prepositions, then I encourage you to start by learning 5 at a time. As you have the translation, you should note down the ones that you think you will use the most and then keep the list at your desk or on your phone as a digital note. When you have to write your next email, you should pull out your list and think of which ones you could include. Remember, it is much easier to learn these in small blocks of 5 than trying to remember then all. Once you start putting them into practice they will become part of your global vocabulary. As always, if you enjoyed this episode then please share it with your friends and family. This way we can reach more people and help them to improve their business English. Don’t forget to listen in for next week’s episode where we will finish the series. Till then take care and have a great Easter.